"We've really noticed the impact that Show Racism the Red Card has made in Islington and had such positive feedback from young people, parents and teachers on the work that I'm pleased to announce that we will be funding the programme for another year." 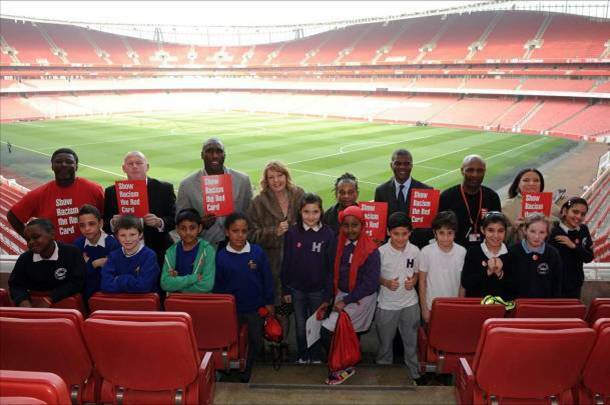 Young people from DraytonPark, Robert Blair and HughMyddletonPrimary Schools, Islington were at Emirates Stadium on Tuesday 13 March for an exciting Show Racism the Red Card event. Young people had the opportunity to take part in a range of educational activities beginning with a tour of the home of Arsenal Football Club followed by some anti-racism workshops. During the afternoon they watched Show Racism the Red Card’s latest DVD featuring a variety of football players and finished the day by posing questions to a panel which included Sol Campbell, Paul Davis, Perry Groves, Luther Blissett, Paul Mortimer, Head of Equalities at the PFA Simone Pound and anti-racism campaigner Doreen Lawrence. Over the last 2 years, Show Racism the Red Card has worked in partnership with Cambridge Education@Islington and Islington Borough Council to deliver a programme of anti-racism workshops to over 4000 young people in Islington. Alan Sefton, Head of Arsenal in the Community said: “We’re delighted to host Show Racism the Red Card and local schoolchildren here at Emirates Stadium today which really challenged the children and promoted an inclusive message. Graham Smith from Cambridge Education said: "Cambridge Education is proud of the effective partnership it has in Islington with SRTRC. It has made a real difference in many of our schools over the last two years."